As the Gardier discover, finding Tremaine and the other rebels is in no way the same as capturing them. Or having captured them, keeping them in captivity. Encountering the rebels usually ends badly for the Gardier. Yet this is not enough to liberate Ile-Rien. The Gardier are something of a mystery; the mystery must be solved if they are to be defeated. The Gardier seem to be monomaniacal fanatics, who refuse to reveal anything important if captured and interrogated. Clues to the puzzle lead the adventurers across dimensions, from modern cities to ruins so old that the names of their builders has been forgotten, from Ile-Rien where magic is respectable to a world where it is forbidden. Bits and pieces of evidence hint at a solution. Can Tremaine find it in time to save her city? This series reminds me strongly of Andre Norton, had Norton written a more elegant prose. Gates between worlds. ancient ruins, interfering shades, cultural conflict: elements in this trilogy that appear in many Norton novels. At the risk of spoilers, I note that Norton’s Kolder and Wells’ Gardier would have much to discuss. I read this trilogy over the space of (counts on fingers) fifteen years, with a long, long gap between The Ships of Air and The Gate of Gods. I do not recommend this approach. The trilogy is essentially one long book. If possible, acquire them all (they are all in print) and read them in one go. This long book is not the best crafted of Wells’ novels. It is just one damn thing after another. Too many characters, too many settings, too many hair’s-breadth escapes. But the characters are appealing and the books are reliable entertainment. 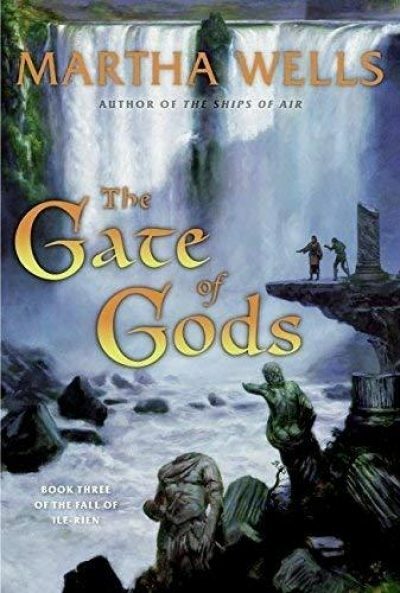 The Gate of Gods is available here (Amazon) and here (Chapters-Indigo).